Tony Blair’s donation of £106,000 to Labour this week – divided between candidates in the party’s 106 designated target seats – doesn’t make him the party largest individual donor (there were seven individuals who gave more in 2014) but he is certainly the most controversial. Property tycoons like David Garrard (£629k), his late friend and former donor to the Tories, Andrew Rosenfeld (£200k), and ex-SDP member and Lib Dem peer Lord Oakeshott (£170k) as well as sculptor Anthony Gormley (£135k) are all squeaky clean by comparison. “I know how hard it can be to raise money to fund a local campaign” said Mr Blair, and how hard it would be therefore to turn down, he might have added. Target seats are bound to be in need of cash to run their campaigns so beggars can’t be choosers. Or can they? So soon after the latest cash for access scandal involving Jack Straw and Malcolm Rifkind, is it really sensible to take cash from the former politician who “enjoys the best contacts that money can buy – as do those willing to pay him for access to those contacts” and is the subject of a new book designed to expose “the private dealings of this very public figure“, who’s made his fortune selling his soul to the oil-rich potentates he mixes with as special envoy in the Middle East and brutal dictators like those of Burma and Kazakhstan? Blair Inc.: The Man Behnind the Mask is due out in two weeks, written by Francis Beckett (co-author of two previous books on Blair), David Hencke (prize-winning investigative journalist who exposed the cash-for-questions scandal and wrote the story that caused the first resignation of Peter Mandelson, over a secret undeclared £373k home loan from fellow Treasury minister, Geoffrey Robinson), and Nick Kochan (author of books on corporate corruption and money laundering). I’m looking forward to it, but those who accept Blair’s money should beware. Labour in Scotland are already paying the price for being joined at the hip with the Tories – and this revelation that candidates in Scotland are being bankrolled by Tony Blair only underlines that Labour simply can’t be trusted. Tony Blair’s bad money will do Labour in Scotland no good. 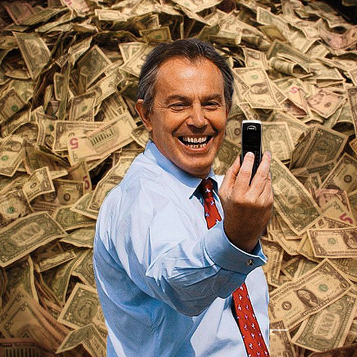 The fact that Labour candidates are happy to accept donations from the man who led us into the illegal war in Iraq, introduced tuition fees and started the process of NHS privatisation is extraordinary. Mind you, it isn’t the candidates in the five Scottish “target seats” to which Blair has donated money who will suffer. No-one expects Labour to win those – it is the Labour MPs who stand to lose their seats in Scotland and others standing in previously safe seats who may do so. But will he be so delighted when Blair Inc. exposes “the complex financial structures in Blair’s world. From the many layers of tax liability to the multiple conflicts of interest produced by his increasing web of relationships“? My advice: stick with union money. The cleanest in politics. Time to empty-chair debate-dodging Dave? Few years ago Campbell was all about getting a safe seat or a seat he would win, and then labour seemingly rejected this, down he goes with a depressive illness now labour wants him again he’s better. I’ve little time for this Blair-rite and what he did with Blair. but Blair can give his money to Blue labour if he wants god help some of that money has people blood all over it, Blair does not mind. Jon – he is the former leader of our party. I’d wager you were a member at that time, as were most of us. If you could stomach that why not this? Former leader but still active within it. Disagreeing with the leader to the point ,where one would fill that the leader ,has acted criminally, doesn’t mean one should leave the party. Michael foot said stuff I disagreed with years after standing down as leader,he wanted livingstone for GLA leader, Kinnock and Hattersley didn’t.and wanted him not allowed to rejoin. The significance is blairs money is due to making a fortune off the trouble he caused in the first place, when foot wanted Livingstone for GLA mayor, in 2000 I’d have preferred him to have kept scrhtum, but his daft comments weren’t directly based on influencing labour due to who he was,the way Blair is trying too.